Jerry's latest book on-sale now! Order your copy below, from Amazon.com, select Costco stores, and local book stores. You can also find a copy at one of these local retailers. Don’t be left out, order your book today! Our website is experiencing a gold rush-type request for adventure information, which this second edition and one-of-a-kind publication supplies. In one reader’s words, “This is a must for ghost town and gold prospecting buffs.” Click on book for details and pricing. 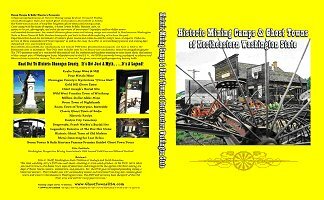 Come along with Boom Towns & Relic Hunters as we hit the dusty trail on our Wild West color DVD video adventure to visit Historic Mining Camps & Ghost Towns of Northeastern Washington State narrated by Jerry Smith. Click on DVD for details and pricing. Many of the ghost town locations listed in Jerry’s book and on his web site and DVD video may be on present day private property. Please consider using one of his reputable and experienced adventure guides found at the Boom Towns & Relic Hunters Premier Guided Ghost Town Tour Package web page for pricing. For new additions, and to join Boom Towns & Relic Hunters team of adventurers visit our updates page. All rights reserved. No portion of this website may be reproduced or transmitted in any form or by means, electronic or mechanical, including photocopy, recording, scanning, digitizing, or any information storage or retrieval system, without prior written permission from Boom Towns & Relic Hunters.